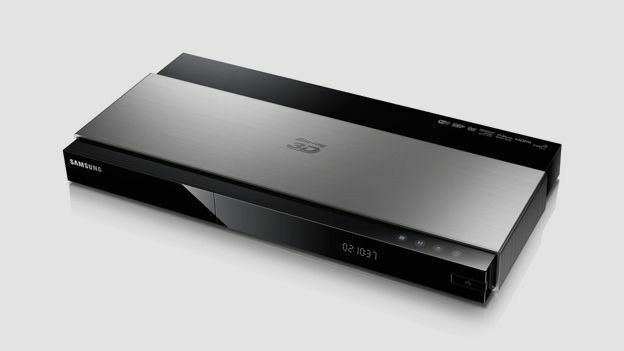 It's not even 5cm high, but the premium Samsung BD-F7500 Blu-ray player is stuffed with every feature going to make sure it stands out in a store full of sleek black disc spinners. Like the Panasonic DMP-BDT330 it can upscale HD video to UHD resolution, only with better connectivity and lots more smart app options. And with AllShare and Wi-Fi on board, there are more wireless ways to get connected to it than the Sony BDP-S5100. And if all that fails, the brushed steel bodywork should get some attention. Apart from universal playback (it cannot read SACD or DVD-A discs) this deck has every feature you could possibly need and a few that you probably won't. Its video scaler converts SD to HD and HD to UHD, so now you have no excuse not to buy that 4K TV. Even more impressive is the choice of apps available to you and the slick interface that helps you access them. All of the catch-up TV services and all of the on-demand services we could think of are here in handy app form and if not pre-installed, they're all free to download. There are literally hundreds more weather, social networking and news apps that you may, or may not find useful. You can decorate the Smart Hub home page with your favourites. Inbuilt Wi-Fi allows you to access music, movie and photo files wherever they happen to be on your network, but with AllShare you can also pass them directly to the player from any other Samsung device. You also get a full house when it comes to AV connections, with two HDMI ports and 7.1 analogue outputs to choose from. Overkill perhaps, but Samsung is keen to leave nothing out of its top-end deck. The concealed USB Host 2.0 port at the front was very quick to recognise our external USB hard drive and played all but the lossless FLAC file from our folder of tricky formats. Compared to Samsung's TVs, where voice recognition and motion control are becoming the norm, this clunky remote control feels old fashioned, but not so the whizzy user interface. Powered by a fast dual-core processor, this deck has a vibrant home page where you can quickly navigate to the apps, which appear as glossy tiles, or to your other media, or even to a Blu-ray disc. Samsung used to take pride in having the fastest loading times when it comes to putting a disc in the tray, but we clocked this deck as taking exactly the same time as the Sony BDP-S5100 (28 seconds from an open disc tray to an on-screen image if you must know). Samsung's image processing always ensures the picture leaps out at you with sharp delineation and popping colours and the BD-F7500 is no exception. In fact, it's in danger of looking artificial and we'd recommend calibrating sharpness and colour in the menu. Blu-ray and particularly 3D Blu-ray offer a high level of detail that'll make you wonder why anyone would want to upscale further to 4K. But while the images couldn't be any crisper, they don't quite have the natural depth of field that the best premium players achieve and the picture is somewhat affected by video noise. It's just a slight graininess in the background and the occasional flicker, but it's enough to hand the picture quality advantage to the aforementioned Sony and Panasonic players. Sonically, we found the Samsung a little forward in the treble and heavy in the bass. It all adds up to a deck that's eager to please, but lacking a little refinement where it counts the most. Without support for SACD, DVD-A or FLAC files, it's not the hi-fi source serious audiophiles are looking for. It's clear from the flawless feature set and the brushed steel bodywork, that the Samsung BD-F7500 is a premium Blu-ray player. Samsung has thrown everything, including 4K scaling and the widest selection of smart apps around into its sleek flagship machine and somehow kept the price below £200. However, we wish the processed picture and forward sound were a little less polished and a little more refined. It's better to perfect your Full HD output before worrying about Ultra HD upscaling in our opinion.